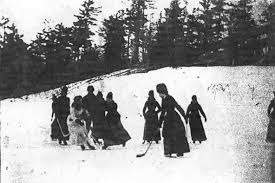 This is a photograph of women playing hockey at Ottawa's Rideau Hall way back in 1890. It is believed to be the earliest recorded image of women playing hockey. Note the lady white. Why she is the only lady in white I do not know. Her identity may be hard to make out in this photo, yet her identity is unmistakable. She is the star female player in Ottawa in this time period. She also happens to be the daughter of Governor General Lord Stanley of Preston - the donator of Stanley Cup! Of all the members of the family, it was Isobel Stanley (one of two daughters) who had the real passion for the game. She attended her first organized hockey game in 1889 at the Montreal Winter Carnival. From that moment on she fell in love with the game, and whenever she could she would put on her customary long skirt and played regular games of shinny at Rideau Hall. She and other Government House ladies enjoyed the game immensely. She was also a regular at the Rideau Rink, a new rink in Ottawa that opened in 1889. The Governor General himself returned to England without ever seeing a single Stanley Cup game, but before he left the passionate love of Canada's game that Isobel and her brothers demonstrated convinced him to authorize the purchase of a trophy to be given to hockey's annual champion in the dominion of Canada - the Stanley Cup! Some sources even suggest it was the kids' who recommended the trophy's creation. In 2002 another trophy was created, honouring Isobel's pioneering status in women's hockey. The Isobel Gathorne-Hardy Award (her married name) was given to "to an active player (at any level) whose values, leadership and personal traits are representative of all female athletes."